Some say that there are only two kinds of houses in the Phoenix area, those that have termite problems and those that will. But is it a foregone conclusion that you’ll have a Queen Creek termite control problem with your home? In just the time it takes to read this homes in Queen Creek are being silently attacked by insidious little wood eating creatures called termites. Before human settlements arrived in the Phoenix valley and Queen Creek, thousands of termites survived on the Desert floor. Give termites food, a water supply and some juicy wood to eat in a sheltered environment (your home! ), and they’ll thrive. With the influx of the human population, termite infestations in Queen Creek are commonplace. With over 6,500 households in Queen Creek alone, termites have a limitless supply of fresh food for years to come. 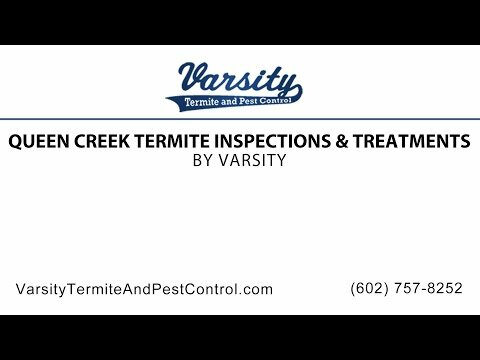 At Varsity Termite and Pest Control we are proud to service the Queen Creek area. When termites begin to invade your home you can count on the professionals at Varsity Termite and Pest control to eradicate the problem with our Queen Creek termite inspections and treatments. Our highly trained technicians are up to date in the latest and very best termite treatment methods. Varsity Termite and pest control is a family owned and operated company that puts its customers first. You are our top priority and we strive to go the extra mile for our customers needs. So don’t wait for your termite problem to get any bigger, call us at 602-757-8252 or visit us online at varsitytermiteandpestcontrol.com today. Getting a termite inspection done by a qualified pest and termite control company in Queen Creek is an excellent example of being proactive where a potential problem is concerned. Make no mistake, Even though, they’re minute in size, termites can and do cause damage to your property. Their sheer numbers, well into the millions per nest, plus their diet is what can cause concern among home and business owners. There are thousands of species of termites, and only a tiny percentage of them are considered pests as such and warrant a call to your local exterminator in Queen Creek. In fact, in tropical areas some termites even serve a vital ecological purpose. Termites eat debris and enrich the soil. In addition as they consume plant detritus and feed on decaying vegetation, they help clear the way for new growth. So, a few termites don’t cause any issues, and are These termites aren’t even a problem. Termites that live near human inhabited areas, however, are a source of major concern. Let’s say your house has little to no wood in its construction, so you are not worried about termites.} It’s not that simple, unfortunately. If termites just fed on wood or wood products then termites would not be as big of an issue as they are. All one would have to do is build their home or office out of materials that termites wouldn’t want to eat. However, termites also eat many other materials including: plastics, paint, silicone adhesives, paper, cloth, and carpets. Sometimes, termites might not eat non-wood products, but they will also sometimes use them to build nests. The aftermath of an infestation of termites is ultimately property damage in varying degrees of severity. Owing to their diet, namely wood and wood products, many termite species damage buildings that are unprotected, as well damage or even destroy other wooden structures. When the termite damage reaches calamitous levels, it’s too late. It is a far better idea to get on the phone to Queen Creek termite exterminator and have a termite inspection done to stop the problem literally in its tracks. Because of how much damage they can cause, termites can be extremely destructive. For example in India, termites ate the equivalent of roughly four thousand US dollars in April of 2011. Because we like the same temperate climates, termites and humans often clash. Termites can cause both severe property damage to the tune of several billion dollars a year. Termites also produce large amounts of greenhouse gases. Termite Damage: How Bad Can It Get? Did You Know that Termites…. Termites Plus Rain Equals More Termites?